Matt Camron often takes inspiration from the runways. 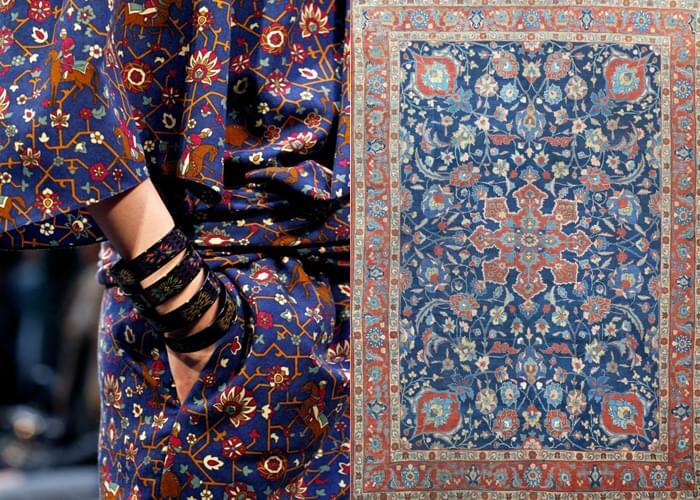 This fall, Hermes did the reverse by translating beautiful Persian carpet designs onto the catwalk. The sumptuous, rich Tabriz carpet motifs could be found on everything from socks to blouses, adding an unexpected pop of color and texture to the Hermes collection. While rugs don't usually play such a prominent role in fashion, it's no surprise that Hermes turned to the Tabriz for inspiration. The carpet, which hails from the Persian city of Tabriz, is known for its fine craftsmanship and luxurious feel. In fact, these rugs have been highly sought-after by designers and collectors for centuries. Check out the Hermes collection and some of our antique Tabriz rugs to match.